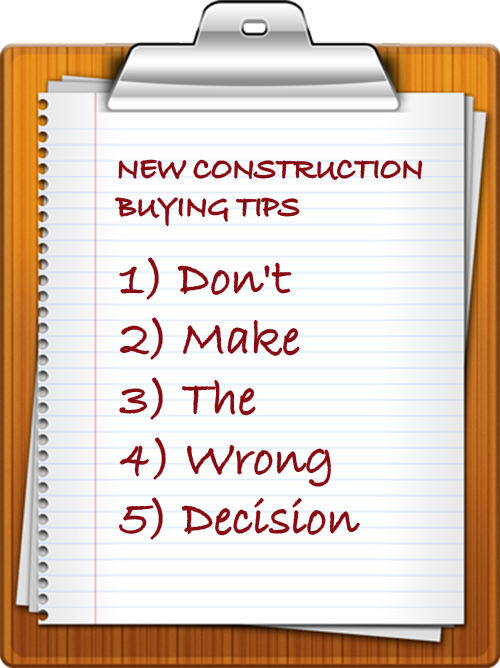 Take a closer look at what you'll need to consider when buying new construction so you don't make the wrong decision. Just like purchasing a re-sale home, checking out the neighborhood and surrounding area is also highly recommended. Drive or walk around to get a good feel for the vibe, find out what kind of amenities are within the community or located nearby, and also be sure to see how living there will impact your day-to-day routine. Will you be close to work, school, shopping, dining, or entertainment? These are all things you’ll definitely want to consider, even when buying new construction. What’s standard and what’s an add-on? Most home builders offer standard features that are part of every floor plan as well as various upgrades that some buyers may prefer. Of course each individual buyer has different priorities and/or design preferences, so deciding what upgrades you may want to take advantage of will be totally up to you. If possible, get a list of standard features and also a separate list of possible upgrades then compare what might be worth the added cost. It’s also possible to negotiate in extra features here and there as well, which is also something to consider when making an offer. One of the real major benefits of buying new construction is that you’ll get to enjoy a home warranty plan that covers any major expenses should something go wrong with the home and/or select features. Keep in mind, though, that home warranties vary in length and in what they cover, so ask as many questions as possible and fully understand what your home warranty will protect should repairs need to be made. Looking to buy a new home in the near future? Start searching Durham new construction homes for sale or call (919) 808-2001 to learn more about the newhome market all over the Triangle area.